This painting is part of a group purchased by the Victoria and Albert Museum in 1876. At the time, it was described as being, "From the Shah's palace at Tehran." 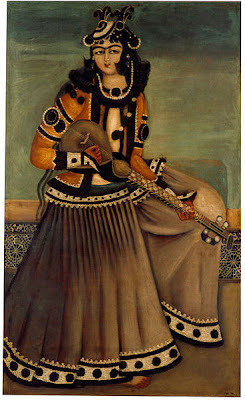 The painting may well have been removed from a palace erected by Fath 'Ali Shah (reigned 1797-1834). His residences were often decorated with series of oil paintings in this style, which were built into the walls. The individual paintings are usually portraits of a single, large human figure. The shapes of the figures are flattened out, but there is a great deal of decorative detail. Many of the series painted for Fath 'Ali Shah show imaginary portraits of members of a royal harem. In this case, a woman is shown playing a guitar. 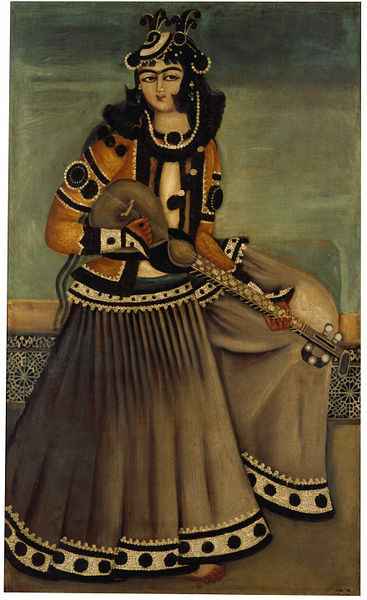 Painting in oils was introduced to Iran after 1600, when the country had strong commercial links with Europe. Production shrank during the troubled period after the Afghan invasion of Iran in 1722. It burst back into life under the Qajar dynasty, who reunited the country in the 1780s and 1790s. Fath 'Ali Shah was the second ruler of this dynasty, and his patronage led to this revival of oil painting.